Book Review: Naomi Wood’s "Mrs Hemingway"
Home » books » read women 2014 » review » Book Review: Naomi Wood’s "Mrs Hemingway"
Last year I had a bit of thing for everything to do with Zelda Fitzgerald reading Save Me The Waltz, Z, and Beautiful Fools, as well as some of Scott’s short stories. This year I’ve been sucked into the same era, but this time I’m looking at the women in Earnest Hemingway’s life. I am unashamedly in love with 1920s Paris (yes, I’m basically Gil from Midnight in Paris), and were I able to go back to any era that would be it. Mrs Hemingway is split into four parts, telling the story of each of Hemingway’s wives, from sweet Hadley, to vivacious Fife, to fellow writer Martha, and journalist Mary. Each section focuses on how they began their relationship with the infamous writer and how it all fell apart. 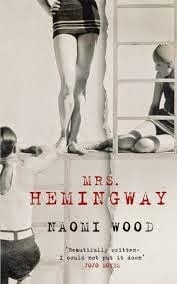 Readers bear witness to Hemingway’s adoration and disregard as he falls in love time and again. We are wooed along as he proclaims love and heartbroken on behalf of these women as it crumbles. It was amazing to discover just how different each of Earnest’s wives were. Hadley was several years older than Earnest and a stranger to the glamorous life they would begin to lead. It seems he was attracted to her straightforward goodness. Fife, by contrast is wealthy, sharp and endlessly fashionable. Martha was fiercely independent and only married Earnest at his insistence. Mary is straight talking and wry. Wood creates each voice and era beautifully and the novel is extremely well constructed. While Wood gives voice to these four very different women, she still evokes sympathy for Earnest. She conjures a version of the writer who knows the right thing to say with his pet names and insistence that he cannot live without each woman. From the outset there are indications that he is unstable, falling into black moods when his writing is not going as he would want for it to be. As a consequence his infatuations felt to me like he was clawing at life, seeking happiness wherever he could find it. What we're left with is a delightfully well researched novel which embraces the romance and tragedy of these women's lives. This is a book for those who enjoy well-researched, evocative historical fiction.